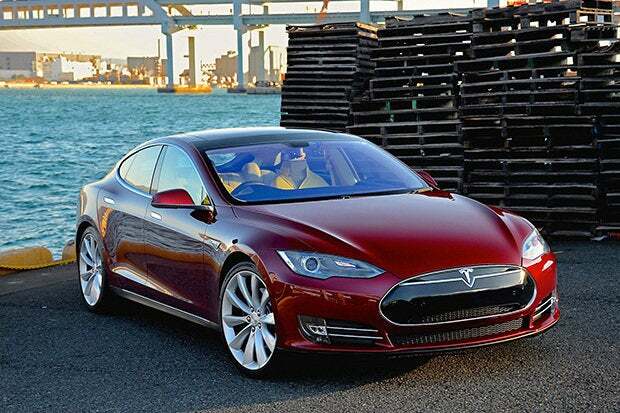 My first test driving the highest end Tesla Model S was a win for technology. Just today, I was able to test the ludicrous mode on a Tesla Model S sedan, driving around on the highways and side-streets of Minneapolis. As it happens, I’ve never driven the high-end P90D version of the Model S with all of the extras (total price tag is around $140,000 with all of the add-ons.) I also tested Autopilot for the first time since it was released and then tweaked a bit, driving in fully autonomous mode at highway speeds and adjusting for traffic on its own. The bright red model I tested felt like a well-proportioned Audi A8, heavy and sure on the road, big enough to transport the family. When you really let it rip, the electric motor feels like it has just inherited some DNA from Bugatti. The Tesla rep told me it has the equivalent of 762-horsepower. I’ve driven a Veyron before, and there’s a similar sense of slicing through thin air, With a Veyron, you feel the power behind you like you are driving a jet. You smell the high-octane fuel. You hope the brakes work. In a Model S, with ludicrous mode enabled, you feel like you are strapped onto a rocket. It's not "ludicrous" to suggest they push off from zero about the same way. I’ve driven just about every other car with aspirations for autonomous driving, including an early look at the Cruise Automation tech and models by Audi, BMW, and Mercedes-Benz. The closest production car is the Volvo XC90, which has a platooning mode for highway driving where the car controls its own steering and speed. It is nothing like this. Many high-end cars have some form of automated steering, but they tend to sway a bit on the road and ask you to put your hand on the wheel. Curiously, the Model S does the same thing, but not for the same reason. It wants to check if you are really paying attention, but not because it is confused about anything. The AI is brilliant. When a car swerved slightly in front of me, the Model S applied light brakes. It mimics human behavior. A computer would normally nudge you more emphatically. In the Model S, speed up and slow downs feel more like what you would do yourself. On curves, there’s barely any side-to-side movement, which means you barely notice the car has taken over. The ultimate win for autonomous driving is that it feels genuine and human-like, not automated. I was blown away by the quick acceleration, I was equally impressed by the technology at work. And, things are improving as far as the infrastructure. In my area of Minneapolis, there are dozens of EV charging stations. There are a handful of supercharging stations within range, including one in Duluth that is within range. If I owned this car, I could easily drive across country -- for free -- charging up to full in 30 minutes. Little things are important, too. The Model S has a massive touchscreen that looks like an iPad Pro on the dash. When you flick the turn signal, you see a matching light in the car’s on-screen animation. When you open the door to get out, the display above the steering wheel shows the door opening. You don’t start the car. It knows you have the key and you’re seated, so you click into drive and go. I also saw how the “summon” mode works. In a parking lot, the car backed out of a parking spot on its own and came to a stop. You can put the car back with a click, too. This might help if your house has a crowded garage (like mine) or you’re at the mall. There’s so much intelligence at work. It's a nirvana state for tech. Back to the Autopilot mode -- the car knows where it's driving. On a two-lane country road, it will only drive up to five miles over the speed limit as a safety measure. On a side street, it won’t let you engage Autopilot. Will most cars start acting like this? It might take a while, but it’s coming. Fortunately, with the Model S, it’s here now.